- Go get a job or just work more hours at your present job. Starting a business or learning to invest successfully isn’t easy. A job is easier. To be able to go to work and get a paycheck every week or two guaranteed - that’s easy! 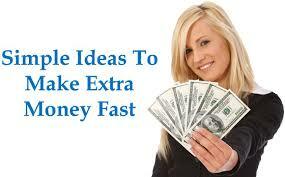 An easy way to make money quickly is to sell whatever you don’t need. Get rid of the second car, the boat you never use, etc. Stop smoking, and learn how to spend less for all the things you buy. If you can spend $14 less each day on unimportant things, you save over $5,000 per year. That’s like making $7,000 more (you have to earn that much to have $5,000 after taxes).